We currently do as many Fender rebuilds than new builds. 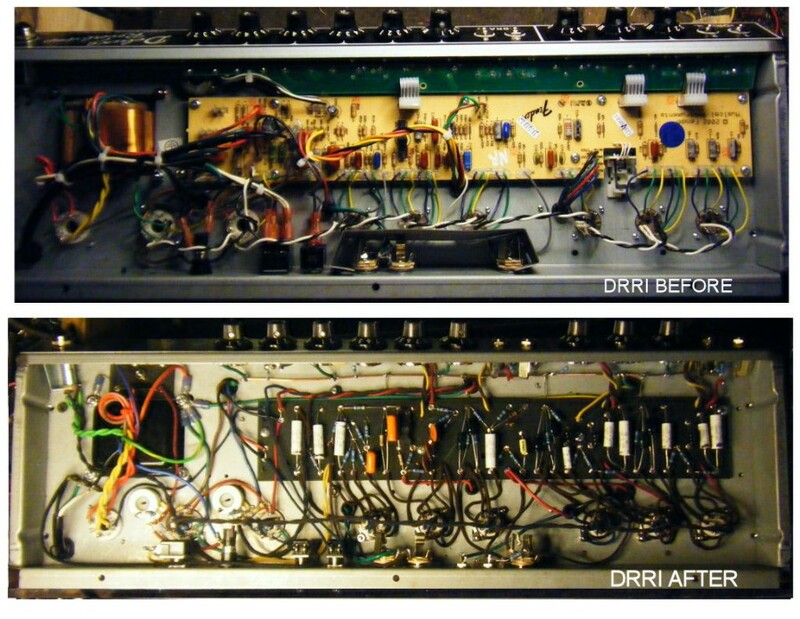 Send us your chassis from any Re-issue Fender Black Face style amp and we remove all of the PCB components, replace everything with hand soldered circuit boards for the main circuit board, filter cap board and bias cap board. Re-builds of Fender re-issue amplifiers saves cost of cabinet and speakers that are generally adequate as is. We rebuild all the of the newer reissue Fenders: '65 Deluxe, '65 Twin Reverb, etc. including the new SF line. You send us the chassis, we gut the chassis and install an old style eyelet board along with other top quality components to end up with a true hand wired version of the amp that was made in the '50s or '60s. Cost is 600USD + r/t shipping. We also offer upgrades such as dual bias pots for precise matching of power tubes, boost mods, etc. We have been servicing vintage tube amplifiers for over 25 years. We've serviced many brands of amplifiers including Fender, Standel, Orange, Magnatone, Vox, Sunn, Marshall, MusicMan and many others. Send, or bring your amplifier for any and all servicing needs from re-capping, re-tubing and bias adjustments to grill cloth and tolex replacements, etc. as well as custom tone mods. We also can "blackface" any "silverface" Fender amplifier. Contact us for pricing.